It was a solemn Christmas for the congregation in Indonesia's Carita, a seaside town left reeling from the tsunami that has killed over 400 people and devastated the western coast of Java, as many churchgoers have fled the area for fear of further disasters. Instead of holding festivities and exchanging presents, Pastor Rusman Anita Sitorus led a tearful vigil at a mass in her small church. 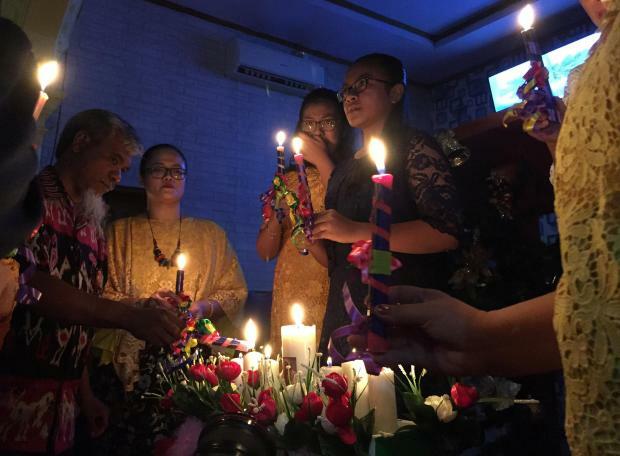 "We were planning on holding a Christmas celebration every year, but this year is different due to the tsunami," Sitorus said, as churchgoers lit candles and cried while praying. The occurrence of the disaster during the Christmas season evoked memories of the Indian Ocean tsunami triggered by an earthquake on December 26, 2004, which killed 226,000 people in 14 countries, including more than 120,000 in Indonesia. Thick ash clouds continued to spew from nearby Anak Krakatau, a volcanic island where a crater collapse on Saturday sent waves smashing into coastal areas on both sides of the Sunda Strait between the islands of Sumatra and Java. At least 429 people were killed and more than 1,400 injured, and 154 people remain missing. Thousands of residents have had to move to higher ground, and officials have extended their high-tide warning to Wednesday. Sitorus said the congregation was much smaller than usual. But residents like Nikson Sihombing, now staying in a temporary evacuation centre, attended. "We usually celebrate with joy and festivities, but with the tsunami, we can only pray humbly and not celebrate much for this year's Christmas," he said. Indonesia has the world's largest Muslim population and is also home to sizeable Christian, Hindu and Buddhist minorities.